Student protesting a tuition hike at Santa Monica College were pepper-sprayed by campus police. The college has defended the action saying that the police offer was forced to release the spray in order to "preserve public and personal safety." The protests were in part due to a plan to allow students to pay extra to get into classes that are already sold out, a move that critic say would favor wealthier students and undermine the community college system. One to watch: how will the court case of Pearson, Cengage, and Macmillan v Boundless Learning play out for OER and open source digital textbook efforts? The three publishers accuse the free textbook startup of copyright infringement. Read all about it. A teacher's aide in Michigan is challenging in court her suspension from work after refusing to give the school access to her Facebook account. The MPAA granted Bully a PG-13 rating this week, lowering it from an R and meaning that when the documentary about school bullying expands to new markets this weekend, more theaters will actually carry it (and more teens in turn, hopefully, will see it). A look at Law.com about litigation challenging library e-reserve policies. Lawsuits in several states accuse colleges, professors and librarians of copyright infringement for making materials available online. Worldreader, the literary non-profit that has distributed Kindles full of e-books to students in sub-Saharan African, has released a beta version of an app that'll provide the same e-reader functionality on cellphones. Harvard librarian Robert Darton vowed that the Digital Public Library of America will launch by April 2013. I'd feared that the Google Art Project was one of the things that was going to get the ax when Larry Page shut down Google Labs. (Remember that? When Google said "more wood behind fewer arrows" and promised to stop focusing on extraneous projects… you know… like augmented reality goggles… or something… I digress) But the Google Art Project got a nice update this week and now boasts art from 151 museums in 40 countries. The project was built with help from Khan Academy's Smarthistory, which contributed over 100 videos to the project. SoFi, short for Social Finance, is expanding its peer-to-peer lending services, enabling alumni at several college to help support student loan programs. The startup was launched from the Stanford Business School last summer, raising $2 million from 40 alumni who gave an average of $50,000 each. That money in turn was loaned to 100 graduate business students. From Guillermo Rauch and the good folks at Learnboost, Codestre.am. It's way for you to live stream your terminal, so as to help make coding demos and tutorials. Google Scholar introduced a new metrics feature, offering some insight into the reach of a particular publication. The release came on April 1, I should note here, along with a bunch of other joke news releases. We're hoping this one's real, because as Alexis Madrigal just noticed, Google Scholar's been booted from prime real estate on the Google toolbar. The learn-to-code site Codecademy has added a module teaching the basics of HTML and CSS. Apple boasted a couple of milestones for iTunesU this week: Open University said it has topped more than 1 million subscriptions via the new iTunes U app and has had more than 50 million downloads of course packages. Stanford too says its content has topped 50 million downloads. At the same time, the Boston Bay State Banner reported this week that many universities remain skeptical of iTunes U, comparing iTunes U to traditional LMS offerings. Talk of a Storybook tablet PC from Intel, as part of its line of Classmates educational hardware. The tablet, aimed at aimed at emerging markets in China and Brazil, may also be available through retail channels in the US "priced below $299." Micromax is reportedly building a 7" tablet for the Indian market, coming in at around $127 (with Pearson on board for content). And the low-cost Aakash tablet, still suffering under some bad press and worse hardware, is looking at a Philadelphia factory and possibly a local deployment. An in-depth look into our e-reading habits by the Pew Research Center. One-fifth of American adults (21%) say that they have read an e-book in the past year. The data suggests that e-books are a real boon to those who love to read. Those who read e-books "stand out in almost every way from other kinds of readers," according to Pew. "Foremost, they are relatively avid readers of books in all formats: 88% of those who read e-books in the past 12 months also read printed books. Compared with other book readers, they read more books. They read more frequently for a host of reasons: for pleasure, for research, for current events, and for work or school. They are also more likely than others to have bought their most recent book, rather than borrowed it." Wired continues its investigation into the physics of Angry Birds -- this time calculating for Angry Birds in space. A new report from the National Center for Education Statistics (NCES) reviews the availability of arts instruction in U.S. public schools between 1999 and 2010. The Shanker Blog examines the data, noting that it only provides "very limited support" for the notion that No Child Left Behind "by itself led to a widespread decrease in the availability of the two “core” arts programs – music and visual arts." According to the analysts at Piper Jaffray, one third of high school students now own an iPhone, double the number from a year ago. 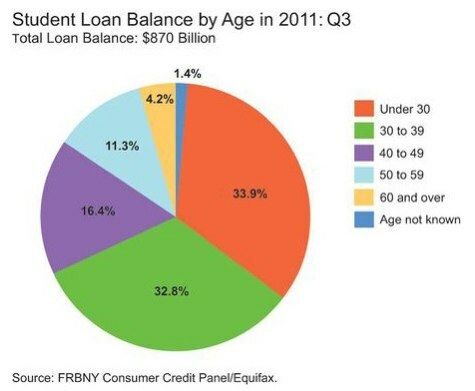 Student loan debt isn't just a problem for the young. See The Atlantic. The Minerva Project announced it has raised $25 million seed funding to launch a new "elite university." See my Inside Higher Ed story for more details. The online learning platform 2tor announced that it has raised $26 million in Series D financing, reports Betabeat. Some early numbers on the sales from the new Pottermore site, the place to buy your digital copies of the Harry Potter books: according to its CEO, it raked in $1.57 million in the first 3 days. Just a reminder: JK Rowling is a very wealthy woman. Seattle's tech blog Geekwire takes a look at StudentRND, a new incubator for "geeky and entrepreneurial high school and college kids." Women who code (or want to learn how to): Interested in Hacker School this summer? Check out this grant from Etsy that will support 10 women's attendance at the 3-month-long program in NYC this summer. "It’s like a writers’ retreat for hackers." Stephen Downes, "Review: The Edupunks' Guide, by Anya Kamenetz"
Doug Belshaw, "Badges: talking at cross purposes?" Robert Moor, "Bones of the Book"
John Naughton, "A manifesto for teaching computer science in the 21st century"
Tony Bates, "Why learning management systems are not going away"